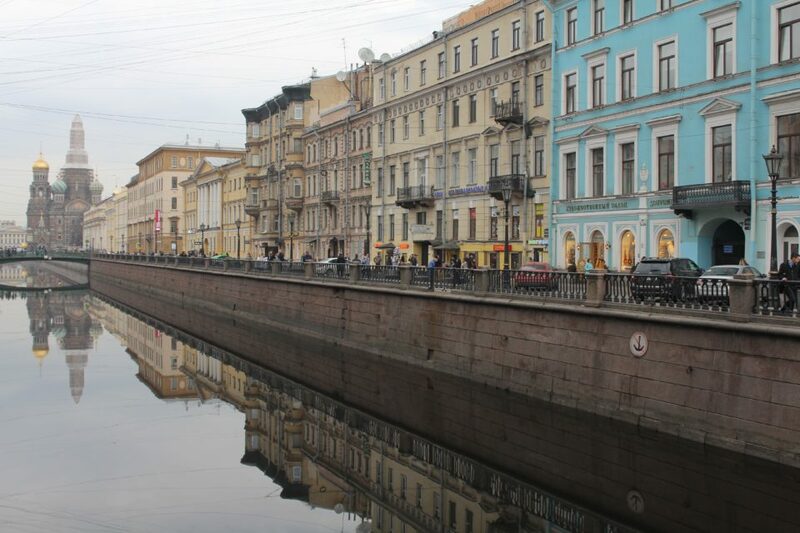 After a nice night in the train coming from Moscow, Team Red arrived on the 15th April in the city everyone dreams of one day visiting: Saint Petersburg. The city has everything to delight its visitors: beautiful types of architecture, a rich cultural and historical heritage, relaxing canals, lively and pleasant public places, and an overall enchanting atmosphere. On top of that, the ambassadors had an amazing time exchanging with motivated young people eager to act for more sustainability. During our first workshop, we enjoyed directly hearing from the participants about ecological initiatives happening in the city. 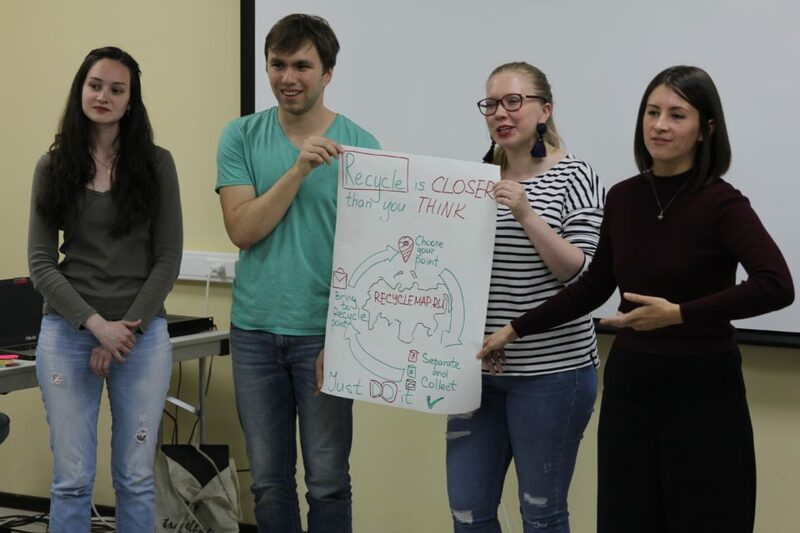 They notably mentioned the existence of the application InDrive to share cars for small distances in the city, and of another called RecycleMap.ru to find recycling places. The workshop on Personal Changes for Sustainability had a powerful impact on the participants, for learning about the intensive use of water, the massive release of greenhouse gases, and the impressive amount of waste generated within the food industry gave them the means to undertake meaningful changes in their daily lives. We were particularly moved after our workshop in a high school to see how curious, concerned, and inspired the pupils were throughout the whole session. Two of them even came to hug us at the end, and some asked to join the project! We could not have wished for a nicer weather to have a city tour. Under a shining sun and a temperature of 20°C, Dima from AEGEE-Sankt-Peterbug took us to explore the touristic spots of the city centre. So we went on top of Saint-Isaac’s Cathedral to have a standing view over the city, and we walked in the Nevsky prospect, the most famous street in Saint Petersburg, due to its width and the gorgeous architecture of its shops and houses. We were also surprised to see the resemblance of the impressive Church of the Savior on Blood with the Basil’s Cathedral in Moscow. The city abounds with splendid palaces, among others the Winter Palace, which now hosts the main collection of the State Hermitage Museum. Nikita, another member of the antenna, brought us there for two little but very enjoyable hours. Even though many of the mural and ceiling decorations were damaged after bombings attacks during World War Two, the restoration was so well done that we could admire the majestic decorations of all the rooms and halls inside. 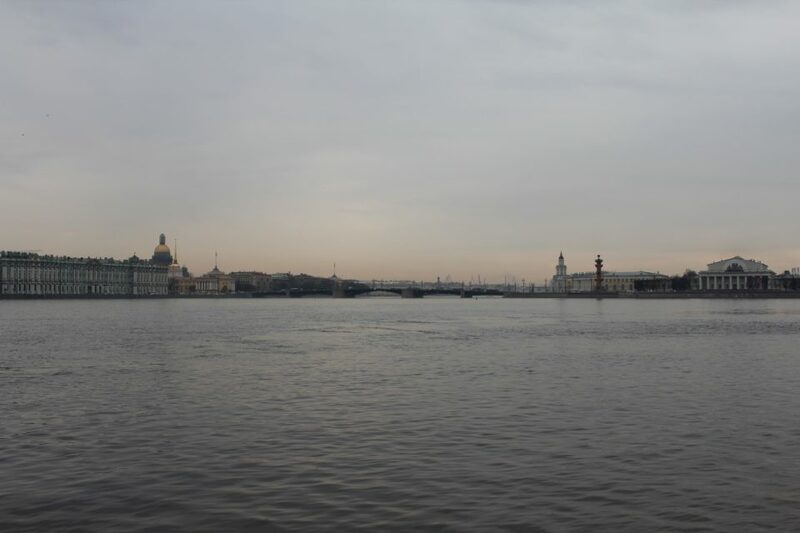 Due to the myriads of bridges across the city, Saint-Petersburg is often called the Venice of the North. All these canals everywhere definitely contribute to its charm and magnificence. In one evening, we stopped in the middle of one of the main bridges being simply stunned by the spectacular view over the enlightened city. 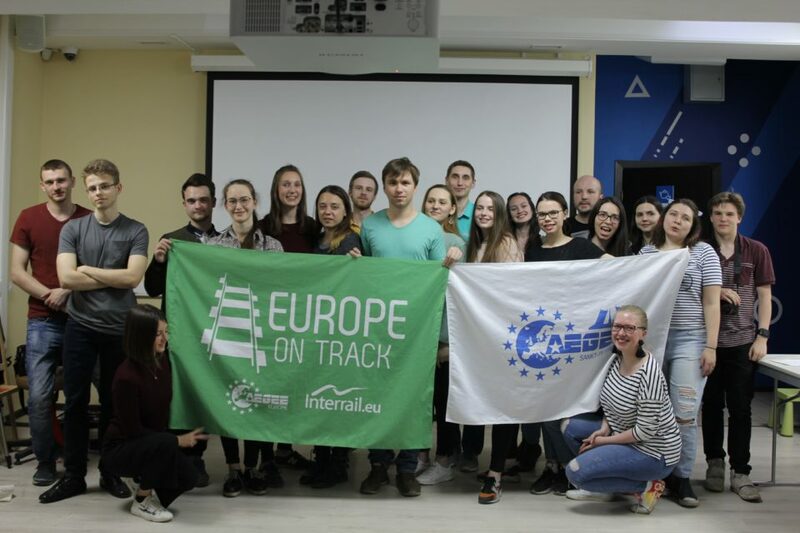 After three amazing days with members of AEGEE-Sankt-Peterburg, we sadly said goodbye to them and thanked them for having organised the perfect stop for us. Once again, a big thank to Sasha for hosting us and cooking delicious dishes every day, and thanks to Georgiy, Polina, Dmitry, Uliana, and all the others for their enthusiasm! We are looking forward to seeing them again somewhere in Europe! Afterwards, we headed to the bus station to take an 11-hour bus ride to Riga, Latvia. However, the journey did not go without complications… Our bus took longer than expected to arrive at the border. To be exact, it arrived 10 minutes after midnight, which means that our visas were expired ten minutes before passing the border control. Like us, you probably think that a ten minutes delay would not cause any trouble. To the contrary, this tiny delay cost us 1000 rubbles each (about 13 Euros) and three hours extra at the border answering questions and waiting for administrative procedures. Even though we were annoyed by this lack of flexibility, we ended up having a lot of fun together, passing time as we could. Fortunately, we could get in another bus without additional cost, and arrived in Riga before midday on the 18th April. Wish to see more pictures of our seventh stop? Check out our album here! 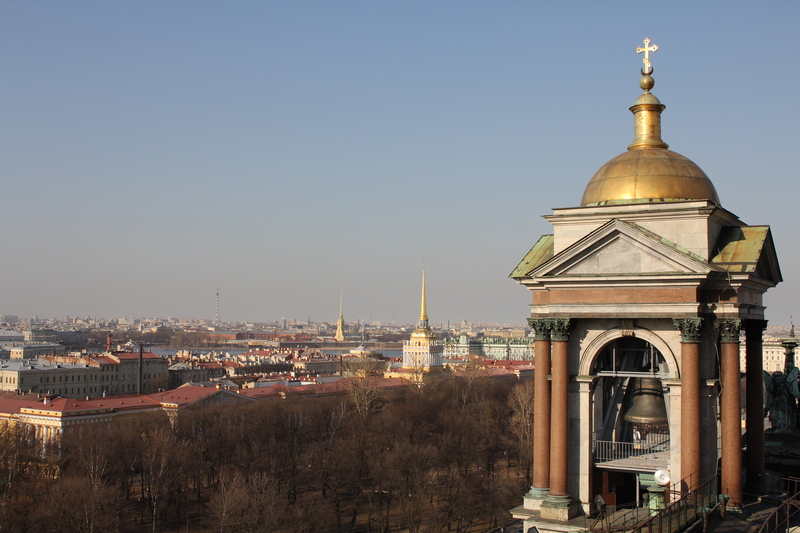 Missed our blog post about our previous stop in Moscow? It is still time to read it here!